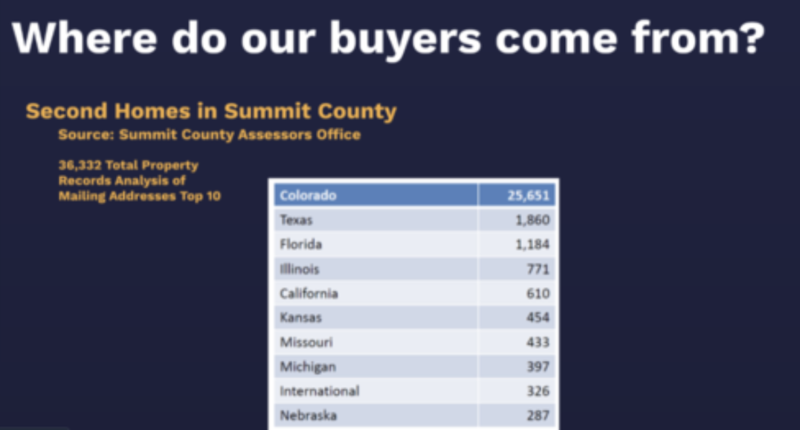 Home/1st Quarter Market Report 2019! Do you see the avalanche chute? We finally are getting the snow we have not had in years! Not only does this mean we will hopefully have a nice summer with little wildfire danger, this will also mean strong summer sales and rental market next ski season. Vacationers will book their lodging based on the previous year’s snow, so expect to see a higher than normal rental season next year. Breckenridge has extended their ski season to last until May 27th, Memorial Day weekend! WOW! Skiing in bikinis and shorts will be a sight to see! The fun to be had in March and April is the best skiing and snow sport adventures in the world! Our ski resorts will never disappoint, so book your last minute trip and get a ski pass. That’s all the planning you need to do! We have five of the best resorts in our county–Arapahoe Basin, Breckenridge, Copper Mountain, Keystone, and Loveland. If snowshoeing, cross country skiing, or tubing is more your flavor, there’s plenty of that too! The market for condos under $400,000 is in high demand right now. As we are seeing in other real estate markets across the country, this is entry level pricing, and people are falling in love with their new vacation condos. The people who are selling are ready to move up, or move to another vacation area, so while they are motivated a little, they are not giving up too much on pricing. The nicer properties aren’t staying on the market longer than a few weeks. The ones in ‘troubled’ HOA communities are just sitting there. Sellers in those communities will most likely take a discount so that they can move on. In order to be a competitive buyer, you will need to be pre-qualified with a lender or banker so that we can submit your offer with the proof of funds. The market for single family homes over $1,000,000 has seen an extreme softening over the last year. Take, for example, that right now in Breckenridge, there are 73 single family detached homes for sale. Only FOUR of those are under $1,000,000. Yes, FOUR. Why? A few reasons…many homeowners are renting their properties during ski season, and will sell in the summer. Expect to see more inventory after all the resorts close, quite possibly a little later this year, June through October. I have said this a hundred times in videos, emails, and on the phone…are you listening now? Historically, our real estate market is similar to what was happening in Denver 18 months ago, and Denver is 18 months behind San Francisco. What was Denver doing a year and a half ago? Still in a Seller’s market with multiple offers. But Denver is starting to cool now, and get more balanced. But not in all sectors. They are also seeing a demand for entry level homes. I anticipate we will continue to mirror their market. However, we also have our own unique but predictable factor of being a second home community. We see a lot of influx of cash from retirees and semi-retirees looking to escape the hectic day to day and heat of big cities. We love our loyal customers from, and keep our eyes on states like Texas, Kansas, Florida, Illinois, California, and more. What is happening in the big industries of those cities? How is the oil & gas market? Where is Amazon going with their new HQ? Answer those questions, and follow the money that trickles up hill to us, because all of those hard working people are looking for their getaway in our mountain paradise. Who do you know in your area that loves skiing? Have you talked with them about using their ski vacation condo as a vehicle to wealth? We have a book that will introduce them to us, as well as a book for real estate professionals only! See the links below to be added to the waitlist. There you have it, folks! We are surviving snowmageddon and while we are thrilled with the snow, we have also been doing a lot of shoveling and cozying up by the warm fire.